Cody Wilson is a polite, 25-year-old law student at the University of Texas in Austin, with dark, close-cropped hair and a forward, affable charm. Cody Wilson is a polite, 25-year-old law student at the University of Texas in Austin, with dark, close-cropped hair and a forward, affable charm. This week he plans to release the blueprint for a gun that can be downloaded from the internet and produced using a 3D printer. He and his friends have spent almost a year developing the Liberator, a “Wiki weapon” that can be assembled from components made on an $8,000 (£5,150) printer that they bought on eBay. Using files shared online, the machine creates the solid parts from layers of plastic. 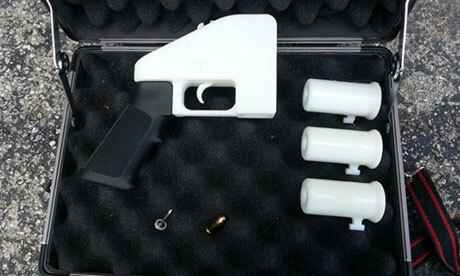 Wilson’s group, Defense Distributed, thinks everyone should have access to a gun and is working to make it possible through Defcad.org, a depository for weapons designs. It was set up in December after its files were removed from another site following the Sandy Hook elementary school shootings. In March, Wilson was issued a federal firearms licence, allowing him to make guns legally. He admits that, given current technology, printing a gun is the least effective way of obtaining a firearm, and that it is easier to simply fashion a gun from the contents of any hardware store. His ambitions don’t stop at firearms. Ultimately, he wants to turn Defcad into “the world’s first unblockable open-source search engine for all 3D printable parts”, a Pirate Bay-style archive not only for printable pistols, but for everything from prosthetic limbs to drugs and birth-control devices.